I am happy to announce the launch of my new startup https://satthwa.com (Purity). Satthwa is my first non IT startup and also the first startup which is a bit personal. The first product we have launched is a Premium Hair Oil! To be honest, I did not think in my wildest dreams that i would be launching a hair oil product.. let alone dabble in the beauty / cosmetic industry but this is how it played out. A couple years back, i noticed sudden hair fall and the tought of going bald stuck me and i could not imagine how that would be.. or rather i did not want to imagine. I tried various products some from the top cosmetic companies and paid thousands but that only helped a little, then a few months back i tried and tested a mix of some oils and they did the trick. Most of these oils, we have used in isolation but when they are mixed with some other oils, they are a potent combination for hair. Once i saw results, i gave it to friends and family to try out and the feedback i got was excellent. That was my moment of clarity!.. why not sell the product and help others as well… that’s how Satthwa was born. 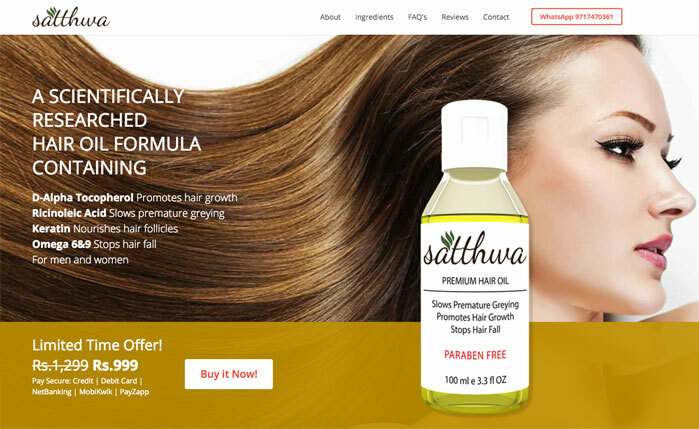 This entry was posted in eCommerce, Startups and tagged Hair Oil, Satthwa by Prashant. Bookmark the permalink.